Paprika Soul are Andy Spiller and Alan Barnes (Soft Sugar Productions). The London-based group is active in this musical community most of you will know as the creators of Acid Jazz. Incognito, Chris Bangs, Gilles Peterson, The Brand New Heavies are names of these scene with a high publicity. To say it straight ahead: Latin influenced Acid Jazz is the style of Paprika Soul and they are just perfect. 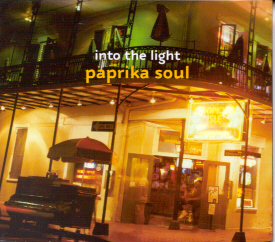 Their second and new album "Into the Light" was released in U.K. and in Japan in 2002. The Japanese release has a bonus track to justify the higher prize on the Japanese music market. The US-version will be published on February 25, 2003. Their music is very audible and a smooth mixture of Latin Jazz, Acid Jazz, Dance floor and Pop Music. The tunes are real charters on radio stations around London as Solar Radio, JazzFM, BBS London and Worldwide Radio One. Too Much Love Makin' is featuring the singer Jacki Hicks. Jacki worked closely with the band Matt Bianco, touring Japan, Indonesia and Europe with them and appearing on their albums "Gran Via", "Another Time : Another Place" and a re-recording of their greatest hits called "A Collection". She can also be heard on albums of Shakatak ("Under Your Spell") as backing singer and saxophonist or Beatifik ("The Blue Window"). Recently she published the solo-project "Spellbound". The song was originally recorded by Gloria Scott in 1974 produced by Barry White. In Germany we call such a tune an "Ohrwurm" that means a hooking dance floor-hit. Friends of Matt Bianco, Incognito and the James Taylor Quartet will love Xiababa. A Latin Jazz influenced tune with a nice Hammond B3 organ interpretation and the typical Latin rhythm, we know from these groups. It's a cover originally performed by Airto Purim in the late seventies. The scatting vocals are presented by Christine Glenn. Ginza Day is a propulsive Electric Jazz/Dance/Chill Out tune with awesome guitar riffs of Malcolm MacFarlane. All other instruments were played by Andy Spiller. If you like this style of music, I suggest the albums Monsieur Charles (Mission De Luxe), Electro Jazz Session, Jazzland Remixed or NoJazz as starting point for further explorations. Flight of the Condor was composed by Andy Spiller and inspired by The Simon Harris Orchestra Composition “Windchant”, which featured Michael Brecker. (Mr. Brecker is a favourite among the band members). Poli Coussee is the creator and performer of the woodwind arrangements. Music of Life was originally written and performed by Cerrone on his album Cerrone IV - The Golden Touch (1978). It was a disco hit in Europe in the dance genre. The vocal interpret of this intriguing cover version is Christine Glenn. Rio Sunset starts with some Latin flute tones. A Bossa styled jamming tune with sampled vocals of Rita Campbell. Slick was originally released by the group Tamba 4, a Bossa Nova group of the '60s. It was a re-formed band previous known as Tamba Trio. The song is taken from a CTI-album called "Samba Blim". Slick was composed by Herb Alpert/Pisano. Pisano was the guitarist in Herb's group Tijuna Brass. Slick keeps up the Latin mood of this fabulous album. My Baby And Me is a dance floor vocal song featuring Gayle Spinner, who has also written this song. Malcolm MacFarlane adds catchy guitar chords. She performs regularly as part of the duo "Topaz" with Andy Spiller combining her own songs with a variety of contemporary music. More Latin flavored music presents Samba Recife. This tune was inspired by Cal Tjader's Samba Sueno. Cal Tjader was one of the most famous non-Latino leader of Latin jazz bands. It's a good example of the crossover effects between the traditional Latin Jazz and Acid Jazz. Dindi was originally composed by Antonio Carl Jobim and Astrud Gilberto. The original was released in 1965 on the "Astrud Gilberto Album". This cover is influenced by Janet Lawson's cover, available again on the sampler "Capitol Rare: Funky Notes from the West Coast" (1999). Andy has accelerated the tempo to make the tune more vivid. Jacki Hicks' voice is fitting to the original perfectly. Songs For Hervé is inspired by "Rio Funk", a song from Lee Ritenour's album "Rio". The song is written for and dedicated to the memory of Herve Gamelin who unfortunately passed away in 2001. Ian Ellis' jazzy improvisations on soprano say show a variety of astonishing variations. "Into The Light" is one of those album one shouldn't miss this year. To make the buy easier you find links to sellers below.